Bearded Dragon Care - Welcome to Critter Camp! The Bearded Dragon is fast becoming the most popular and highly recommended lizard pet, and for good reason. These animals are docile and enjoy human interaction. As adults in general they are not wiggly like geckos and anoles, nor are they aggressive and temperamental like iguanas. They are relatively sturdy and live about 7-9 years. Beardies, as aficionados refer to them, may be only a few inches long at pet stores when they are very young, but they grow to approximately 2 feet as adults. Beardies are also non-allergenic pets. Bearded dragons get their name from the skin under their chins which they puff out and turn black making it look like a beard when they are stressed, challenging another bearded dragon for territory or courting. Their somewhat intimidating looks – the larger size, spikes and ’beard’– are just exciting enough for those wanting to have a little something different as a pet. These same features are mainly to protect them from their natural predators. Bearded Dragons are native to the desert areas of Australia where their unique markings help camouflage them in the sandy terrain. The spikes along their sides are more rubber-like than sharp and they serve to deter such critters as Tasmanian devils from having a lizard lunch. Bearded Dragons are no longer imported into the United States, those available for sale now have been bred here in captivity. Likely due to their calm nature and easy care not many bearded dragons are in rescue situations. 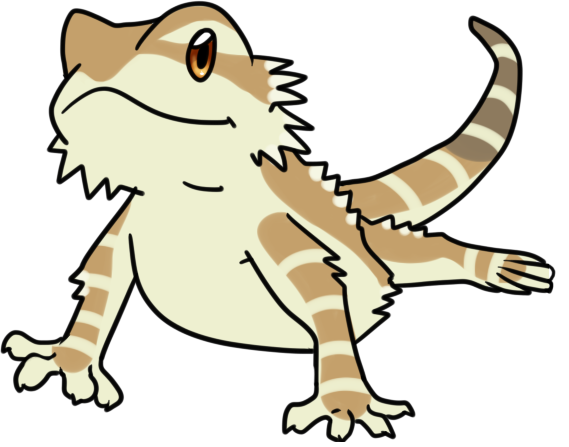 You can often find healthy active young lizards at many area pet stores or from private breeders for a cost of approximately $50 to $80. Younger smaller bearded dragons can start out in a 20 gallon aquarium, but adults do need a 50 -75 gallon size. It is a myth that you can keep reptiles from growing large by housing them in a small container. All such confinement will do is stunt their development, make them aggressive and cause serious health problems. Beardies are cold blooded so they need a heat source to bring their body temperatures up high enough for their food to digest. A heat light above the aquarium on the screened top with a 60 watt light bulb is usually sufficient to bring one area of the tank to the 90-100 degrees they need. You will need a thermometer on the tank so you can be sure one area is reaching the desired temperature while another area remains cooler. They also need a UVB full spectrum light also above the tank to provide the sun’s rays they need to produce necessary nutrients they would get in the wild. These two lights can be set on a timer to be on 12 hours and off 12 as well. Just be sure the tank itself is not in a cold location and doesn’t fall below 60 degrees at any time. A climbing log, basking rock (placed under the heat lamp), and 2 shallow bowls are all the cage accessories your pet will need. You can add a hammock if you like. Do not use a heated rock that plugs in. Beardies in nature get their heat from above and their stomachs do not register heat fast enough so they can get burned or even die on a heated rock. The best substrate for the bottom of the cage is newspaper. They will not accidentally ingest it like they can sand or bark. It is cheap and very easy to clean. The adult beardies will only have a bowel movement mixed with urea (they go ‘all in one’) every few days, so just take out the old and put in the new as soon as he goes. Weekly you will want to wipe down the cage with aquarium cleaning wipes or a vinegar solution, then rinse with damp paper towels. Scrub the water and food bowls weekly or more often if needed, with dish soap and water, rinse well so no residue is left. Bearded dragons in the wild go thru what's called brumation- it is like a light hibernation. 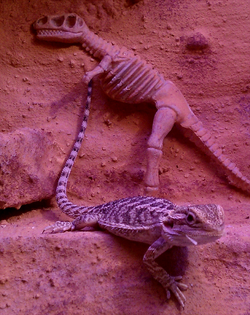 Domestic bred beardies are not equipped to withstand brumation as a rule and it is often fatal. It usually happens when the outdoor temperatures drop and their tank area is cooler than normal. Their tank must always be kept at the above stated temperatures and not allowed to drop low enough for them to brumate. If they seem sluggish and won't wake up as normal be sure to warm them up significantly and they should respond quickly. We cannot state enough how dangerous brumation is for pet beardies. A young dragon will need dozens of tiny crickets, meal worms, or silkworms daily, and fresh greens, and some vegetables (favorites include dandelion and turnip greens, grated squash and yams.) Once the lizard is about 6 months old and nearly grown they need far fewer bugs and more vegetation. Canned insects can be purchased at pet sores or online if you prefer not to deal with the live ones. There are even new services online that will send you prepackaged meals for your lizard! Prior to feeding, a few times a week the insects should be dusted with calcium powder (again found at pet stores or online.) This can be done by placing the bugs in a Ziploc bag with a small amount of the powder and shaking – kind of a shake-n-bake health food for your beardie. Feeding a bearded dragon insects that are too large for him can cause a fatal intestinal blockage. A good rule of thumb is to feed insects that are no larger in length than the space between the dragon’s eyes. It is best to feed insects purchased at bait stores or pet shops to be sure they are free from chemicals and disease. NEVER feed lightning bugs to a bearded dragon - they are poisonous to them! Bearded dragons are solitary animals and should not be housed with each other. In fact they should not be housed where they can even see another beardie or they will spend all of their time in an agitated state either trying to challenge the other lizard for territory or courting it, causing detrimental stress to the animal. In general beardies do not bite or snap at people. However, if any animal, no matter how docile, is stressed or hungry biting can occur. Bearded dragons have no actual teeth, they have ridged gums with serrated tooth-like projections that are part of the jaw itself to chew their food. Their bite is significantly less dangerous than that of an iguana. It is very important to wash your hands with soap and water before handling any animal to remove smells of food and germs you may be carrying – hand sanitizer is not recommended for this as some may remain on your hands and can harm the lizard. Then they should be washed again with soap and water or hand sanitizer afterwards. As with all reptiles Bearded dragons have a small amount of salmonella in their digestive system, however risk to healthy individuals are nil when proper sanitation is used. People with autoimmune disorders or other compromising conditions should handle reptiles and amphibians minimally, if at all. • Hold him while you watch TV or are on the computer. He may be interested in the screen and from time to time try to reach out to it with his tongue. He may try to climb up onto your shoulder, or snuggle on your lap where it is warm. • Wrap him up in a small towel like a burrito. Have a flap open at one end for his head. He will probably go to sleep if he is nice and warm. • Take him out to play in the grass. Be sure to have him on a harness and leash or in a play yard so he does not run away. Also be sure there are no chemicals on the lawn that could harm him. • Talk to him often, he will recognize your voice when you come into a room and near him. Watch him tilt his head to look up at you. Please feel free to contact us with your Critter Questions!